Image courtesy Michael P. Taylor, Landsat Data Continuity Mission Project Office, NASA Goddard Space Flight Center. Caption by Michon Scott with information from Michael Abrams, NASA Jet Propulsion Laboratory. Situated in the southern Andes Mountains, the Payún volcanic field of Argentina is a complex landscape that formed over hundreds of thousands of years. Sprawling over 5,200 square kilometers (2,000 square miles), Payún is a massive shield volcano—a broad formation resembling an ancient warrior shield. 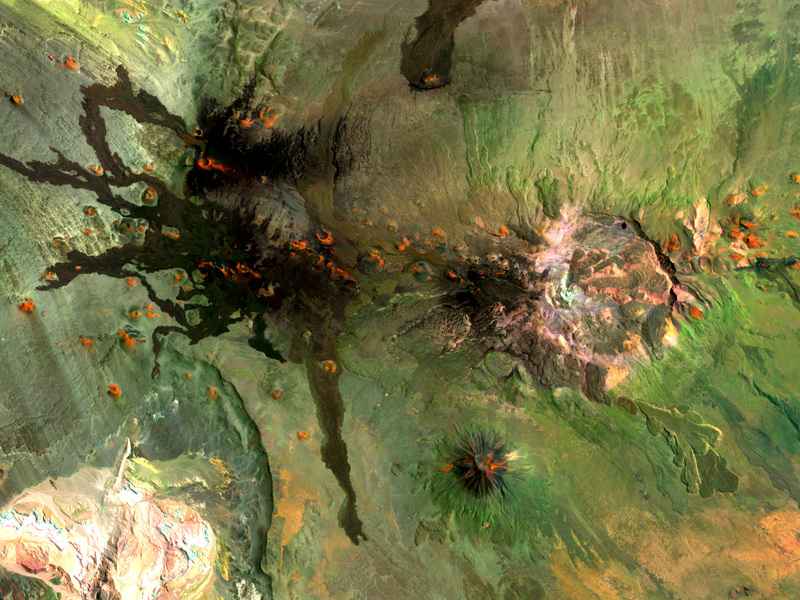 This false-color image is a composite of observations acquired on February 7 and March 20, 2001 by the Enhanced Thematic Mapper Plus on the Landsat 7 satellite. It was made from a combination of visible and infrared light, where green indicates vegetation, black indicates lava flows, and orange is bare rock rich in iron oxides. Part of the back-arc volcanism of the Andes, Payún lies about 530 kilometers (330 miles) east from where the Nazca plate subducts below the South America plate. Not surprisingly, a volcanic zone extends over some 1,000 kilometers (600 miles) north-to-south in this region. According to a study published in 2010, the regional geology and chemical composition of the rocks indicate that the volcanic field likely formed within the past 300,000 years. The stratovolcano may be the most prominent feature in the volcanic field but it is by no means the only one. 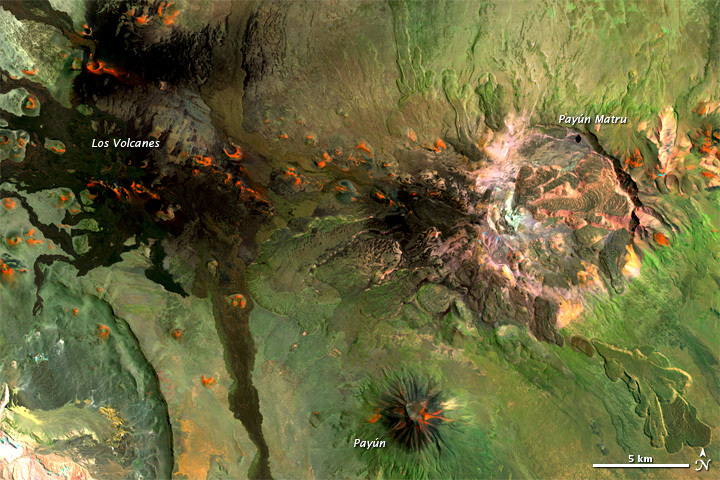 More than 300 eruptive features litter the shield volcano, most of them occupying an east-west line. West of Payún Matru is an area known as Los Volcanes, a mass of strombolian cones and basaltic lava flows. Germa, A., Quidelleur, X., Gillot, P.Y., Tchilinguirian, P. (2010) Volcanic evolution of the back-arc Pleistocene Payún Matru volcanic field (Argentina). Journal of South American Earth Sciences, 29(3), 717&nash;730. Global Volcanism Program. Payún Matru. Smithsonian Institution. Accessed November 21, 2012.